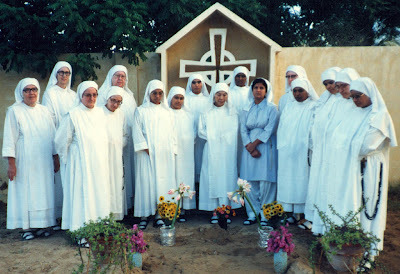 The Dominican Nuns of Karachi. Because of the climate the sisters wear white veils all the time. In just so happens that their Sr. Mary Catherine's brother and sister-in-law are parishioners of our parish here in Summit and have sung for us in our parlor! Two of the foundresses! What is more interesting—the camel or the shoes? There is only one cloistered convent in Pakistan. It is the Monastery of the Angels in Karachi. It hosts nine Dominican sisters: seven of them are Pakistani, one is American, and one Sri Lankan. They dedicate their lives to constant prayer for Christians, but that's not all. One of them tells AsiaNews: "Always round the clock at least one sister is present in the chapel for prayer and adoration of the Blessed Sacrament. Our prayers are not only for Christians, instead we pray for everyone, and we don’t discriminate. Anyone from any faith who is in need of prayer can come to us to seek help through our prayers. Besides Catholics, many including Muslims, Protestants and sometimes from other faiths visit us to ask for prayers. And many write us letters or use telephone, fax and e-mail to send us prayer requests." The Monastery of the Angels is a place dear to many Muslims. The sisters explain: "Many Muslims believe in our prayers and come themselves or via some friends, and they also support our monastery. Our whole cloistered life is dedicated to prayer and sacrifice, to pray for the country and the world. We help society, the Church and people in their needs and sufferings through our prayers. In short, no one is excluded from our prayers. We don’t preach and teach, we find the solution of every problem in prayer." The mother superior of the monastery and her assistant read the newspapers to learn about the situation in the world. "We tell the other sisters about the important things happening there, like attacks, rising prices, or other needs and sufferings of the people. And we add all these things in our prayers." The monastery has a retreat house where individuals or religious or lay groups go to meditate and pray. "We do all the arrangements ourselves for people who come here for retreats, including cooking." The sisters are separated from the outside world by a grate. This divides them from the guests who visit them, from the priest who celebrates Mass for them, and even from the relatives who come to visit them on certain days. Speaking of the small number of sisters at the monastery, the Dominicans say that many families see monastic life as a very difficult road, and therefore usually discourage their daughters from entering the cloistered community. In this regard, Fr. Bonnie Mendes, a respected elderly priest in the area, explains to AsiaNews that "it is a prayer life and has to be seen with the eyes of faith that their prayers are helpful to the local Church and society." Daily life in the convent is similar to that in other cloisters throughout the world. The sisters typically make bread, cakes, and sweets - Fr. Mendes is quick to point out that these "are excellent" - and make hosts and wine for the parishes. These "products" are placed near a small opening where some lay people come to pick them up. They are then brought to delivery services, or directly to the parishes. The story of the creation of the convent in Karachi began in the 1950's. The Dominican Francesco Benedetto Cialeo, a native of Avellino who became bishop of Faisalabad in 1960, wanted to open a cloistered convent in Pakistan. He got to know some contemplative sisters from Los Angeles, and tried to get them to move to his adopted country. But the foundation of the cloister came a few years later, at the initiative of Archbishop Joseph Marie Anthony Cordeiro. When he became archbishop of Karachi in 1958, one of his first decisions was to invite a community of contemplative nuns to the diocese. 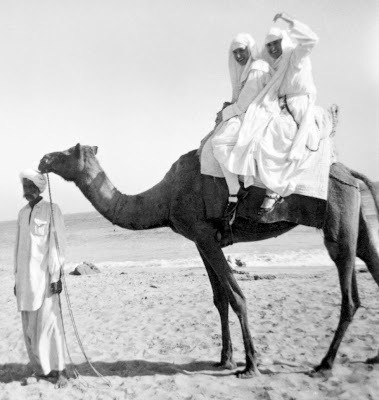 He called the sisters of Los Angeles, and two Dominicans, Mother Mary Gabriel and Sister Mary Imelda, arrived in Karachi in April of 1959. In December of that same year, nine contemplative nuns from the monastery in Los Angeles arrived in Pakistan to found the monastery in the city. After nine years, on July 20, 1968, the convent was moved from Ingle Road to its current location outside of Karachi (in the photo, the group of sisters in the initial years after the relocation of the monastery). CELEBRATION WITH SURPRISES: Giving the Fruits of Contemplation!